Do you love spells, sweets, and a sassy sleuth? Then this is the boxed set for you. Special note--Hexes and Other Hairy Situations is exclusive to this set. The only place you can get a copy of this story is right here. 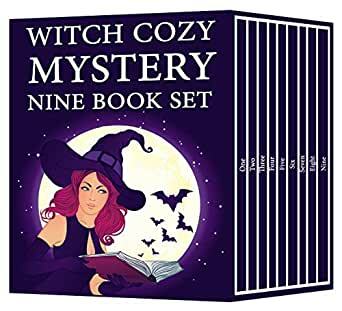 Buy a copy of Witch Cozy Mystery Nine Book Set right now! Meg Walton hopes her days of sleuthing are behind her. So when another murder occurs, the secret witch turned sleuth finds her life turned upside down. This time, the case is personal when Meg finds out one of her dearest friends is the victim. Even more, Meg's friend has made enemies of the most influential family in town. Somehow, Meg has to find a way to navigate her grief while cracking her hardest case yet. Is Meg finally in over her head? I really hate to shoot down an aspiring writer but this author really needs help. Several words were used incorrectly and sentence structure was very awkward. But to me, the worst thing was that each story was a cookie cut-out of the last story in themes and events and the same phrases were used over and over. I liked the general theme of the witch and the detective but she really needs an editor or perhaps to take some writing courses either online or at a community college. I found this to be an enjoyable as an entertaining read. I'll admit it would have been more so if the author would have found ways to introduce her talking cat into the stories because after about the third story in it began to sound monotonous. You have to wonder about the detective skills of the cop boyfriend if he didn't find it questionable that strange things happened every time his girlfriend went to check to see if there was an open back door...ijs. Otherwise it's just like I said before, it's an entertaining read. To bad it took 10 books to get to where it has come. In many aspects this should have been the 1st book. Let me explain over the last year I've read over a 120 cozy mysteries of many authors & book series. I think I can say that I have become a somewhat expert on what I consider is a great cozy mystery. 99% of them had cats as I have cats of my own & over my lifetime & I love these cat cozy mysteries because I love cats. However the 7 books of this series was missing the rich personal lives of all the main characters. These books only had enough to keep the it coherent. The characters were very sketchy in development. It was the facts & only the facts in these novels. 8 & 9 started to see any interaction with the main characters. 10 finally gave a lot of details about the lives & past of these characters. I wish the author had brought in Pamela much earlier. It would have had made the stories more interesting as we get to see the development of the friendship between the 3 women as well as the background of Meg's boyfriend & his secret. All of this could have added more interest to those early novels instead of being dry facts only. Well I am glad the author has wised up. In a sense, those 7 novels didn't do any service to the series. If Ms. Morgan continues with new story arc I will will be pleased and looking forward to read about Meg, Beth, Connor & Pamala's relationships. It will be very interesting & a much better written stories. Also having to read all these books 1 right after another helped to put some perspective that reading each novel 1 at a time & then waiting for months for next novel to come out helped a great deal in writing this review. 4.0 out of 5 starsQuite a twist. I am not really into the type of books that would involve witch craft of any kind, but, these books seemed light and whimsical and I was enjoying them, and then at the end. If you want to talk about a twist, I was fine that they found another witch, but, the part about Connor being a werewolf was just stupidly ridiculous. It ruined the whole set for me. If this series had gone on any further with him using his abi!ities, I would have stopped reading and deleted the whole box set.